Aphrodite Beachfront Village is one of the best properties listed in Cyprus44 property reviews. The Evergreen Developments group construct quality apartments and villas in desirable areas in Northern Cyprus. Their international team have years of experience in the property business, and the group are proud of their high level of construction expertise. The Evergreen group are involved in thirteen Northern Cyprus developments, including the Crystal Bay and Blue Bay Village developments. Aphrodite Beachfront Village bucks the current east coast development trend by overlooking the sweeping Morfou Bay, near the west coast town of Guzelyurt. This quieter coast of Northern Cyprus has been a popular place to live for centuries, as the nearby Bronze Age copper mines, Roman temple site, and Persian palace of Vouni Palace perched high on the cliff top prove. 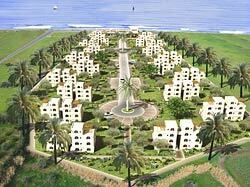 The Aphrodite Beachfront Village site is not truly beachfront, but as close as regulations will allow. Curiously, none of the apartment blocks are at the sea end of this rectangular site, and the prime spot is taken by the Aphrodite Wellness and Fitness Centre. The best views will definitely be from the outside swimming pool! Access to the apartments is via a central road that runs the length of the site from top to bottom, with two circular plazas for parking. The Aphrodite Beachfront Village comprises of 120 beachfront apartments with views across the Mediterranean Sea to the west, and south to the Troodos Mountains at the heart of the island of Cyprus. 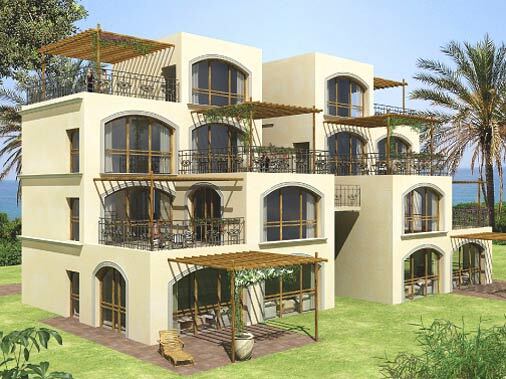 The two bedroom apartments offers 80sqm of living space and a terrace, whilst the 3 bedroom apartment gives 100sqm of living space plus terrace, a good amount of space compared to some developments on the east coast. The apartments generally are square in layout, and are perhaps not the most exciting layout available, but all bedrooms are evenly proportioned, and the master ensuite bathroom does feature an actual bath. In the garden apartments, the terraces wrap around the two outside walls of main living space, effectively extending the living space on either side, a nice piece of design. The terrace apartments again have the terrace accessed from the main living space. The penthouses feature both a downstairs and upstairs terrace, with the master bedroom on the upper story. Specifications offered as standard include ceramic floor tiles, kitted kitchen in a choice of colours, white good pack including a fridge-freezer and washing machine, double-glazing and aluminium double-glazing. All apartments come with a five-year guarantee. The Aphrodite Wellness and Fitness Centre, with its curved arches and columns, is certainly an elegant building, and features a semi-Olympic swimming pool, children's pool, jacuzzi, sauna, massage room, and indoor gym. Outside, you can practice your backhand on the tennis court, or beat the neighbours in a game of volleyball. Afterward a game, you can celebrate your victory with a fresh fruit drink at the Wellness Center - very virtuous! No need to drive offsite for dinner either, with the Terrace Bar and Restaurant being onsite. Chances are, you'll start the evening watching the sunset from the rooftop of the Sunset cafe-Bar. Distances to airports are a little further from Guzelyurt, with Ercan airport a 40 minute drive, and south Cyprus airports a longer 75 minutes, due to the current lack of convenient border crossing points in the west. Evergreen Developments claim that the Aphrodite Beachfront Village is the only beachfront village in North Cyprus with a pre-1974 Turkish title deed. Others may dispute this 'only' claim, but certainly the reassurance of the original title makes this a development well worth investigating. [TRNC CULTURE] "The island of Aphrodite and us"
CAN YOU BETTER THIS Kyrenia Area Bargain - 70cl Aphrodite wine? Fast growing evergreen hedge ???? 2 bed mini villa beachfront TO LET all bills(electric etc) INCLUDED!!! Title Deed for Aphrodite Development - Is it "water-tight?" Aphrodite Beachfront, Guzelyurt: any update? club Guzelyurt Bar not nuts about Brits!!!! Any Info on rumoured dual carriageway from Alsancak to Guzelyurt ??? Aphrodite Beach Front Development, Guzelyurt, - Pros and Cons ? Shopping in Guzelyurt - The cheaper option! anyone done the rounds recently for beachfront villas/aprtments? Anybody buying Crystal Bay Marina (Evergreen Dev)? Do other people have complaints about Evergreen? This web page is served on 19 April 2019 at 23:17:02.